Kandi Burruss held a private listening session recently where she shared the vision behind her upcoming “Kandi Koated” project. She also gave me a lil one on one where we spoke about her plans to make Lawrence Washington an international superstar with “Closet Freak” the song she penned for him on RHOA. 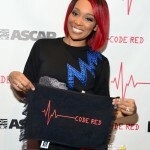 Kandi has a lot of great tracks on her new album. 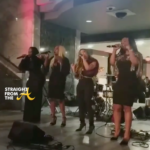 The first being a ballad called “Haven’t Loved Right,” a song Kandi wrote after the untimely death of her ex-fiance’ Ashley “AJ” Jewell. 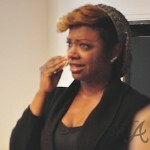 Kandi revealed how she drew from that painful period in her life and you could hear the emotion in the lyrics and Kandi belted out the chorus as we were previewing the song. 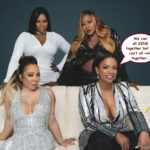 There’s not many features on the album, however Kandi does work with Ne-Yo on “Me and You” and the song “Super Woman” reunites her with fellow Xscape member Tameka “Tiny” Cottle for an ode to single mothers (or mothers who’s men are locked away or otherwise unavailable). Kandi got a bit emotional as she discussed the song “Leroy Jones,” penned in honor of her step father. If you recall, Kandi revealed on The Real Housewives of Atlanta that she wasn’t really close to her biological dad and in fact, it was her step father who raised her as his own. In the middle of the session, Kandi expressed how he touched her life and noted the importance of touching the lives of children in some way. Some how…. I could personally do without another “Baby Mama” song but all in all I like Kandi’s new album. Her vocals pleasantly surprised me. Kandi Koated hits shelves December 14th.